CDE Fastener Inc. is a family owned & operated bulk fastener distributor, founded in 1995. We want to help you build the world. All fasteners online are in stock and ready to ship same day, Monday - Friday. We aim to offer the best prices and availability. CDE has estabilished shipping locations across America to assure you quick deliveries, outstanding service and the highest quality of fasteners. We offer viable solutions for all your fastening needs. Please contact us for help with any product or ask about hard to find specialty fasteners on our Customs Order page. 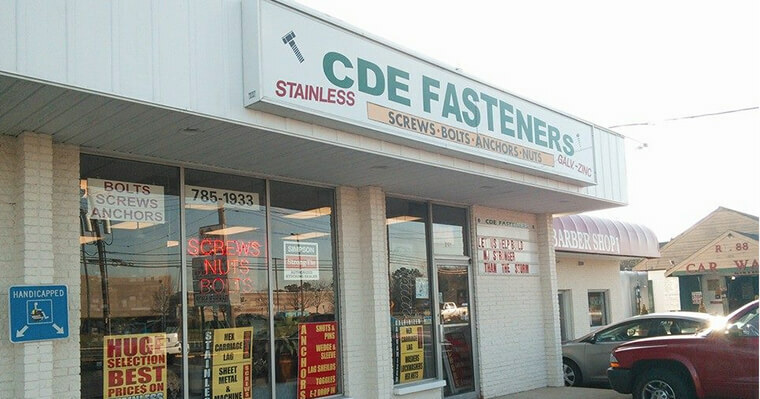 CDE Fasteners also has a walk-in storefront located in Brick, New Jersey. Easy online ordering, fast shipping, high quality bulk fasteners at your fingertips - Saving you time and money. Let's get building! Just like so many other successful companies, CDE began in 1995 in a 15x20’ one-car garage. Within one year, as supplies increased and shelves overflowed, we opened a storefront on Rt. 88 in Brick, NJ. Created to serve both walk-in customers and bulk industrial suppliers alike, CDE quickly became a destination place for all kinds of industry needs, and for over two decades, users of all types have passed through our doors. CDE Fasteners supports the local municipalities, marinas, automotive, manufacturing, construction, utilities, schools, and more not only in the Ocean/Monmouth County areas but throughout New Jersey and across the country. Selling bulk screws, bolts and nuts, CDE Fasteners has an edge over traditional hardware supply stores, as prices are cut lower, to match individual needs. Customers wanting only a few parts to fix something around the house are welcome at the storefront as well as high end bulk consumers. From an idea, to a garage, to a storefront, CDE Fasteners has grown over the years, and now history has repeated itself once again as, in 2015, we expanded further to meet the needs of our customers by including bulk online fastener distribution. Over 30 years ago, Ed Heck, a few years out of college, with a degree in business, started working for a large fastener company. He worked his way up the ladder from the stock room, to shipping and receiving, to inside and outside sales. His experience and expertise, along with his outgoing personality, led to many successes and eventually he became head of sales and then General Manager. Solving problems was Ed’s forte. He was acutely attuned to providing ultimate customer satisfaction no matter how small or big the job. His work ethic and his mind for the business led Ed to expand the company business to include importers, which doubled their profits. Since Ed’s early days in college, it had always been his dream to own his own business. After learning his trade, paying his dues, and gaining experience at a larger firm, the chance to break out on his own became Ed’s most obvious next move. Thus, CDE Fasteners was born. Since those early days, Ed’s uncanny ability to work with people and problem solve has led to over 20 years of success and growth. Ed Heck is a family man, married for 35 years to his wife, Connie, and currently resides in Brick, NJ, a few miles from his store. Ed’s passion for his work is unparalleled as he rises every day to open the store, and rarely takes vacations. Even during a serious battle with cancer, Ed could not be stopped from opening his store to help his customers, even making calls for deliveries from home. His practice and principles helped him earn his reputation with his many customers who trust and depend on him. You build a better world one day at a time. ’CDE’ represents the names of the founder, Ed, the owner, Ed's wife, Connie, and their son, Daniel, who created this website. The name was formed while sitting around the kitchen table in 1995. Since it was going to be a family owned and run business, Daniel, at age 8, came up with the idea of CDE, and they’ve never looked back. I have shopped at CDE Fasteners for many years and have never been disappointed. They always have what I am looking for and the owner Ed Heck is always available to answer any questions I have. They usually ship the merchandise the same day and I have it within a day or two. I would highly recommend this company. -Natures Best Landscaping Inc.